We begin and end with you. Our support structure and constructs are open-ended and fully customizable. We will help you build a call-flow that will ensure success on every call - the customer getting the answers that they need. The short answer is - whatever you need us to do. Our Ohio-based call center staff is a versatile group. They are skilled for a wide range of situations, with extensive background checks, trained to be discrete and use the latest in telephony technology. That is entirely up to you. If you would prefer a human taking messages from your customers and providing them with basic company info we can do that and make sure you receive the information. If you want us to run Tier 1 screening on your CATV/IPTV, 611 or other services to give your on-call staff and labor costs a rest, we can certainly do that. We can handle all of these things for you and more. 24 hours a day, 365 days a year. Trust us to be there for your customers when you cannot be. Go to bed at night knowing that your customers wont be left to an unresponsive and impersonal recording but will receive the prompt and courteous attention they deserve. Why expand your Customer Care? We are not here to replace you. No one could know what your customer's needs are better than you. We are here when you cannot be. We supplement your own customer service and support and extend that to 24 hours a day, 365 days a year. A recent study says that 66% of consumers have ended a business relationship due the lack of customer service and 61% switched to a competitor. It's more important now than ever to make sure your customers reach someone representing your company at all times. From covering phones during a simple downtime or meeting to providing overnight and weekend access, your customers will always reach a live human being that can give them the attention and assistance that they deserve. We are powered by our own in-house PBX that is the backbone of our setup. We can setup any number of call-in scenarios, from direct ring live, to deep-menu to live ring, or the newly popular time-frame callback. 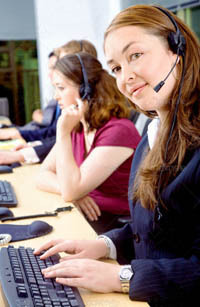 Any outbound call costs are handled by us entirely. The only telephony fees required beyond that is simply your source 800 number. Our system can also be directly linked to your in-house phone system via SIP. This improves redundancy, allows you to avoid long distance charges for incoming calls, and makes any hand-offs more seamless. Our call center has built-in physical redundancy and is powered by our onsite battery systems and power generation for 99.999% up-time.